This 8.3 mile hike follows the Pass Mountain Trail from the route 211 trailhead up to the Pass Mountain Hut. 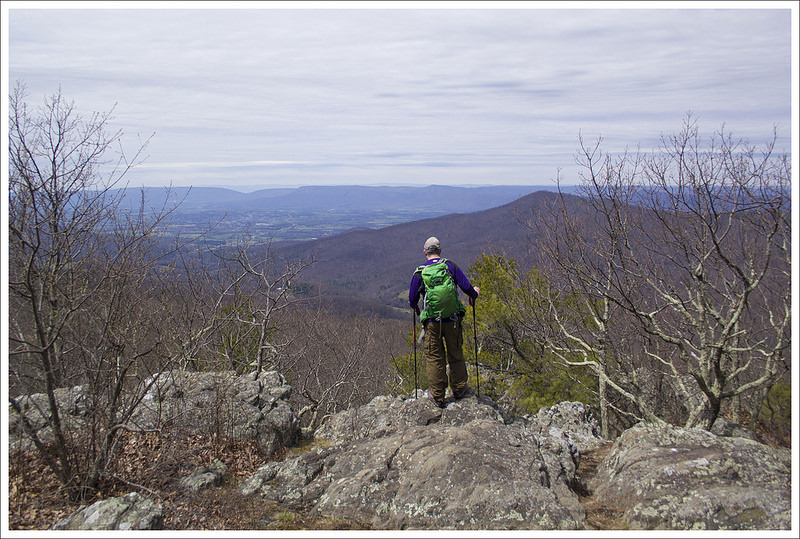 From there, you’ll follow the Appalachian Trail north to the beautiful viewpoint at Double Bear Rocks. 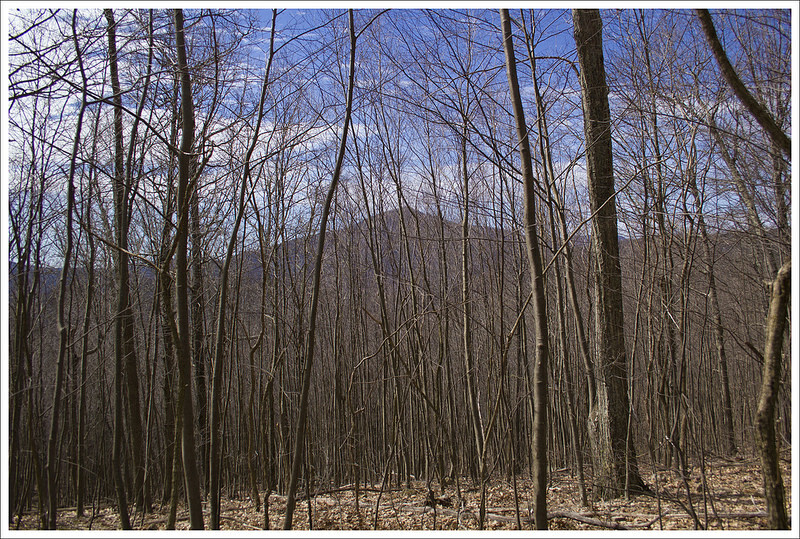 The view from Double Bear Rocks looks in the direction of Strickler Knob, Kennedy Peak, and Duncan Knob. The first weekend in April, we met up with Tony & Linda (of Hiking Upward fame) for a day of exploring a new trail and a new brewery. When we were discussing route options, Tony tossed out the idea of climbing the Pass Mountain trail for a visit to the same-named Appalachian Trail shelter. The route was about five miles with 1,300 feet of climbing – perfectly moderate for my recovering ankle injury. We initially planned to hike on Saturday, but sleet, rain, and high winds compelled us to postpone for Sunday’s more pleasant forecast. 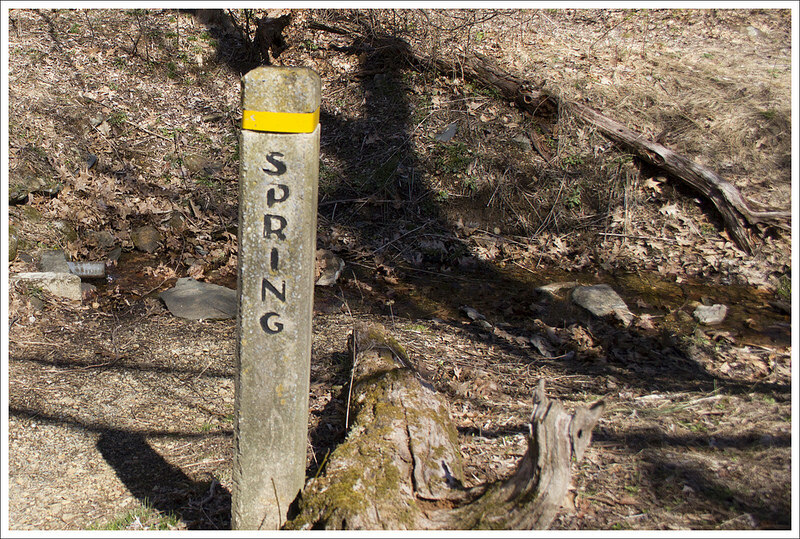 We met at the trailhead along Route 211, just a little bit west of Sperryville. The trail begins at the cement marker post across the road. 211 can be very busy and its twists and turns are often traveled at speed, so be extremely careful crossing the road from your car to the Pass Mountain trail. The Pass Mountain trail was beautifully maintained – blowdowns were cleared, branches were trimmed back, and it looked like someone had put a lot of time installing new water bars. The hike began with a meandering series of switchbacks that climbed steadily but gently uphill. At about the one mile mark, we reached another cement marker. At the marker, you’ll notice a defunct, unlabeled fire road; stay to the left and follow the blue-blazed Pass Mountain trail uphill. The trail continues uphill for almost a mile before leveling out on the ridge. 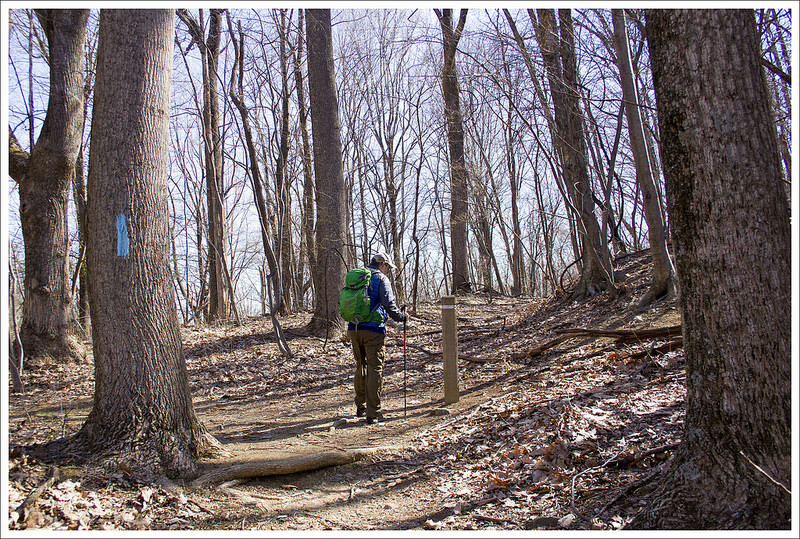 If you happen to hike this trail in winter or early spring, you’ll get great views of Marys Rock through the trees. 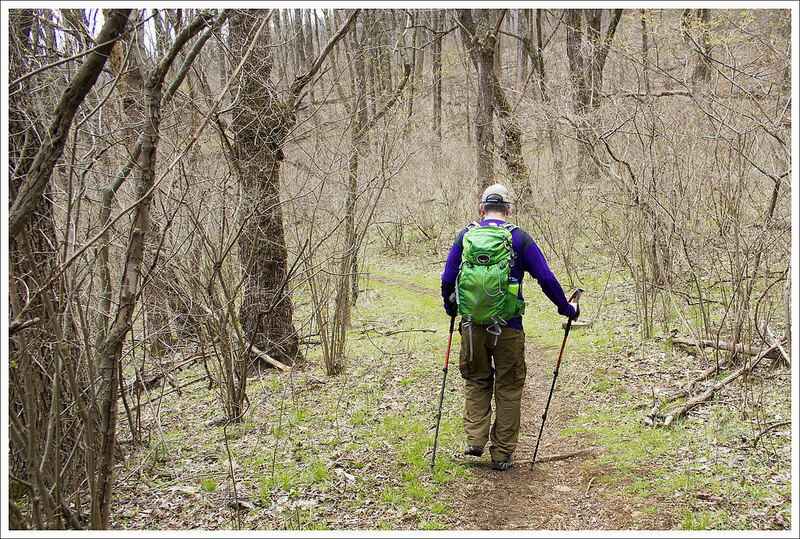 Our hike started from a trailhead on route 211 near Sperryville. Below: A trailmarker in the middle of the woods. It appears there used to be another trail or fireroad at the marker that is no longer maintained; Our hiking entourage; A view of Marys Rock through the trees. 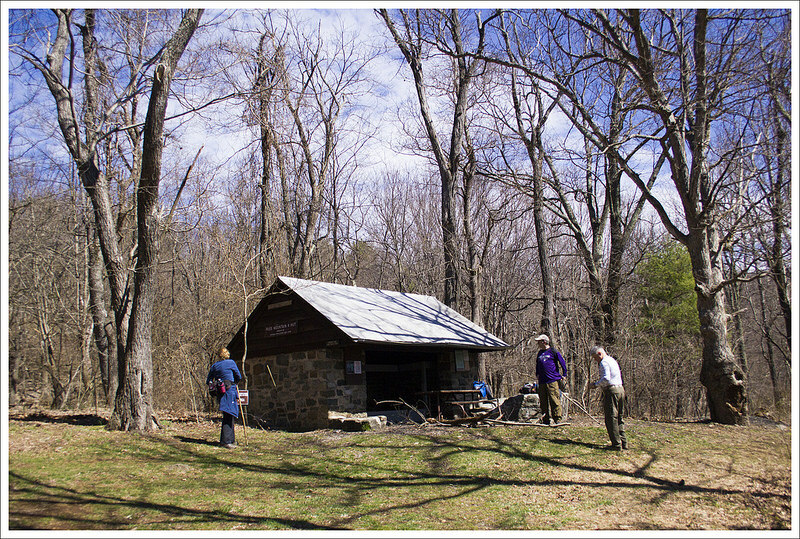 At 2.8 miles, the trail ends at Pass Mountain Hut – one of the park’s nine Appalachian Trail shelters. The shelter is a typical structure with a nearby spring and privy. The unusual thing about Pass Mountain Hut that sets it apart from other AT shelters in the park is that it has a fairly new bear locker instead of a bear pole. A couple years ago, the Pass Mountain Hut was closed due to aggressive bear activity. In late summer, a young, extremely thin black bear destroyed the tent of an ATC Ridgerunner. She was out on patrol and came back to a flattened, saliva-covered tent. Park authorities closed the shelter area until the bear could be trapped and relocated to a less populated part of the park. We spent a few minutes at the shelter debating the rest of our hike. I mentioned to Tony and Linda that I remembered a nice vista just north of the Pass Mountain summit. My ankle felt OK and even though I wasn’t sure exactly how far it was to the viewpoint, I thought I would be OK pressing on. We all agreed that a view always makes extra miles worthwhile. 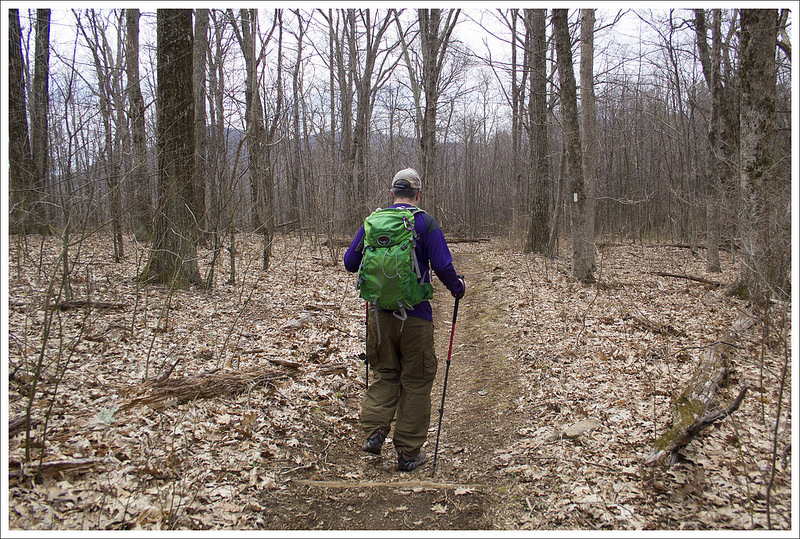 We followed the blue-blazed spur trail from the hut to its junction with the Appalachian Trail. We headed north on the AT for about a mile, reaching the rocky but viewless summit of Pass Mountain. This summit does not have a cement marker. You’ll know you crossed the summit only because you start descending again. When we crossed the summit, we were still vaguely guessing about how much further we needed to hike to reach the view. 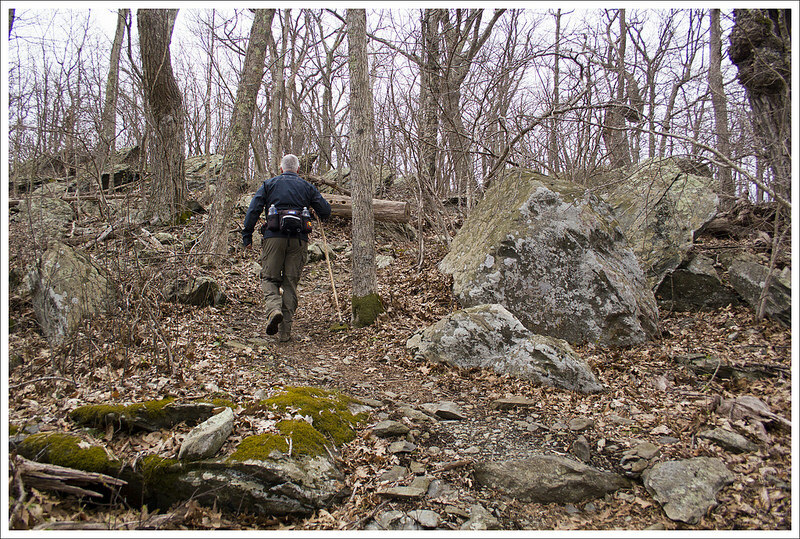 We explored off-trail a little on rocky outcroppings, but they all turned out to be closed in by trees. Adam jogged ahead to scout for the view. Tony, Linda, and I were all several hundred yards back when we heard Adam shouting ‘BEAR, BEAR, BEAR(S)’. We all raced ahead, too – because who wants to miss a bear sighting? Shortly before reaching the junction with the Applachian Trail, we passed the Pass Mountain Hut. 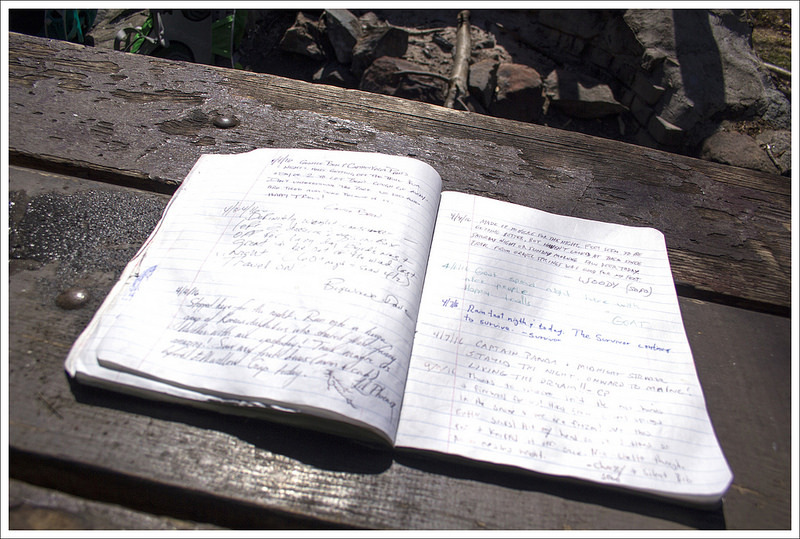 Below: The hut’s water source; Shelter log; Adam hiking the AT. We got there just in time to see two big, furry rear ends disappearing into the brush. Adam, however, got a great close-up view of the bears. Lucky! Just a couple tenths of a mile past the bears, we spotted the side path to the view – Double Bear Rocks, named for the high population of bears in this area. The view itself is quite nice, but what I remember most about this rocky outcropping is its seasonal abundance in blueberries! Last time we hiked by this spot, it was July and there were berries everywhere! In the short time we sat and enjoyed the view, clouds moved in, so we decided to be on our way. The hike back simply retraced our steps coming up. Since it was mostly downhill, it went by really quickly. Before we knew it, we were back at our cars for a total hike of 8.3 miles with 1,750 feet of climbing. We were all quite ready to make our way into Sperryville for some post-hike refreshments. We decided to pick up a to-go order from the Creekside Deli. It’s a humble-looking building painted bright yellow, but there is nothing humble about their baked goods. They make top-notch sandwiches on homemade bread, cookies, brownies, and other pastries. We took our food over to Pen Druid brewery to enjoy a couple beers with lunch. The brewery doesn’t have a kitchen, so they follow picnic rules. The guys at Pen Druid do small batches of interesting beers – most featuring wild yeast strains. We had great conversation and agreed that we really must get out together more often. Great day with friends! We always enjoy hiking with Tony and Linda. When you get people together that have done a lot of hiking, our conversations always quickly go through talking about different trail systems. We can all talk through different routes as if we were following a map along in our heads. I’m not sure if it is dull conversation for others, but we enjoy talking about the places we have been or have been hoping to go. 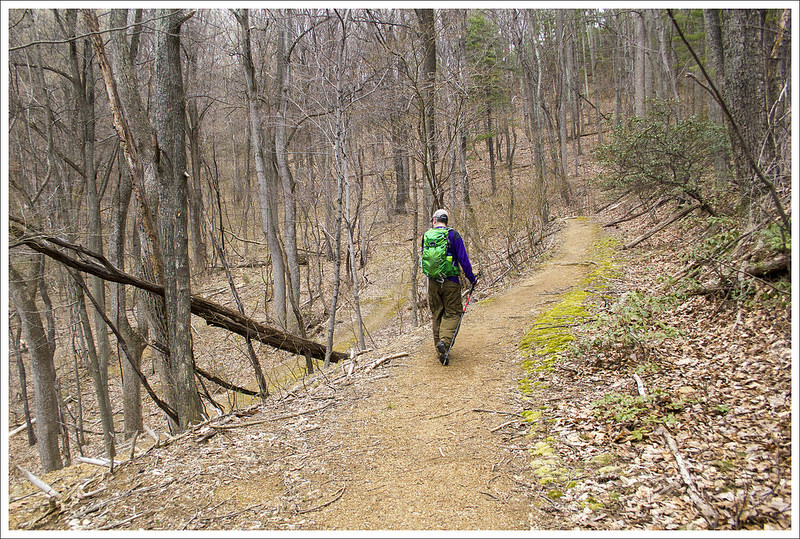 Both Hiking Upward and our site were created to share our experiences. We may have different approaches to the content, but we do this because of our love of nature and the ability to share hiking ideas with others. We consider ourselves lucky to live where we live and to be able to have all of these experiences so close by – and we hope you enjoy it as well. With Christine nursing an ankle injury, we picked a route that she thought would be a decent test with a little elevation but not overly challenging. This route isn’t well-traveled and is accessed from outside of Shenandoah National Park on US-211, in between Luray and Sperryville, VA. We arrived a few minutes before Tony and Linda, so we parked where we felt was the correct spot – a gravel pull-off at the bottom of a steep curve. I consulted a map of the area and felt we were correct, but we didn’t see a signpost to designate the beginning of the trail. I got out of the car and crossed the road near the sharp curve in the road and found the trail marker. We saw a mama bear and her yearling cub not far from the viewpoint. Below: Tony scales a rocky lump near the summit of Pass Mountain. The trail starts as the Pass Mountain trail. While we felt this isn’t a heavily-traversed trail, we were surprised at how well this small section has been maintained. The hike on the Pass Mountain Trail is a steady uphill climb, but the conditions of the trail made for easy footing. On the way up, we caught up with what was going on with our lives – from aging parents to worrisome dogs to trail sections to hiker rescues to beer. Around the 2.75 mile mark, we reached the Pass Mountain Shelter. We stopped and ate a snack and checked out the hiking log. Christine’s ankle was feeling decent, so we decided to press further up the trail. At the shelter, there is a junction with the fire road (Pass Mountain Hut Road), but the trail ascends up to the left of the shelter as you are facing it. 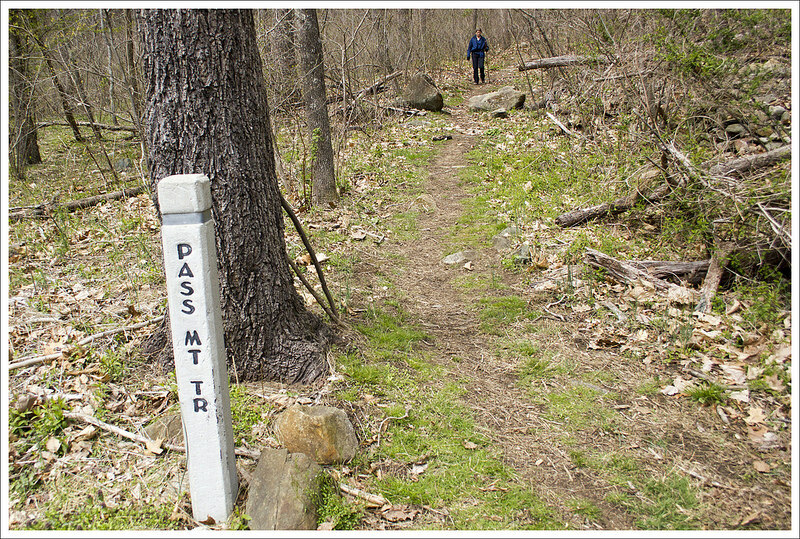 We continued up the trail until we reached the junction with the Appalachian Trail at 3.0 miles. We remembered we found a nice overlook on Pass Mountain that was off the trail and we didn’t think it was too terribly far so we decided to try and find it again together. We took a right, heading north on the white-blazed AT. The trail continued to go slightly uphill, but the grade wasn’t as steep as most of the Pass Mountain Trail. When we carried onward for about a mile, I decided to scout ahead a bit since I didn’t want Christine to put a lot of undue pressure on her ankle. Trekking up ahead at a brisk speed, I came across a mother bear and a yearling bear cub ambling close to the trail. They were both curious about me, so I said a few “Hey, bears” to let them know I wasn’t a threat. They slowly were walking away, paying me little mind so I shouted back at the rest of the group “BEAR, BEAR” to let them know I spotted one. I wondered if the group thought I was shouting for beer instead, but they understood. 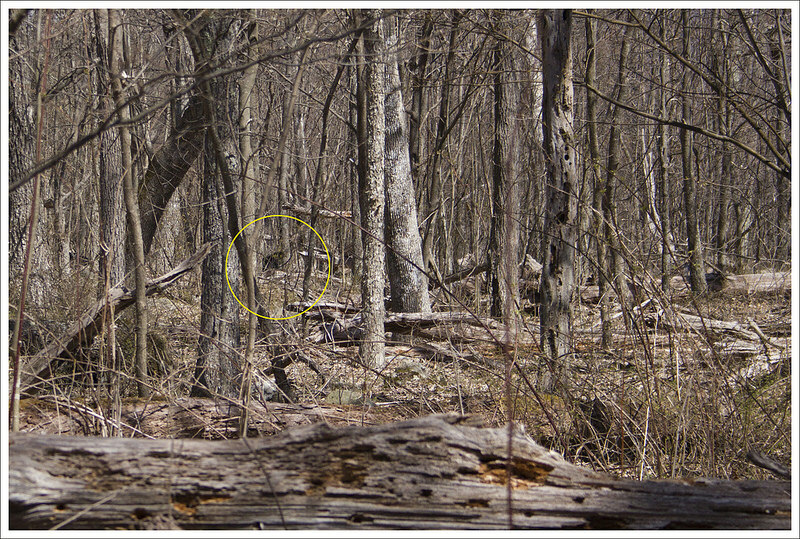 When they caught up, they were able to see the bears not too far off but they had moved away from their comfy spot. The trail down is nicely graded with switchbacks. Below: Green plants were just beginning to reappear; Parking area – the road crossing can be very treacherous. Right around the corner from where we spotted the bear, we saw the jumbled rocks on the left of the trail that we remembered as being the viewpoint. We cut off the trail and out onto the rocks to enjoy a nice view to the west. There are nicer views in the park, but on a clear day you can see ridges of mountains for miles. After taking in the view for a few minutes, we made our way back to our cars. We continued our trip to Creekside Deli and then Pen Druid Brewery for some delicious food and drink before parting ways. We look forward to our next adventure with them! Elevation Change – 1730 ft. Difficulty – 3. This was a nice, moderate hike with steady but well-graded climbing. Trail Conditions – 4.5. 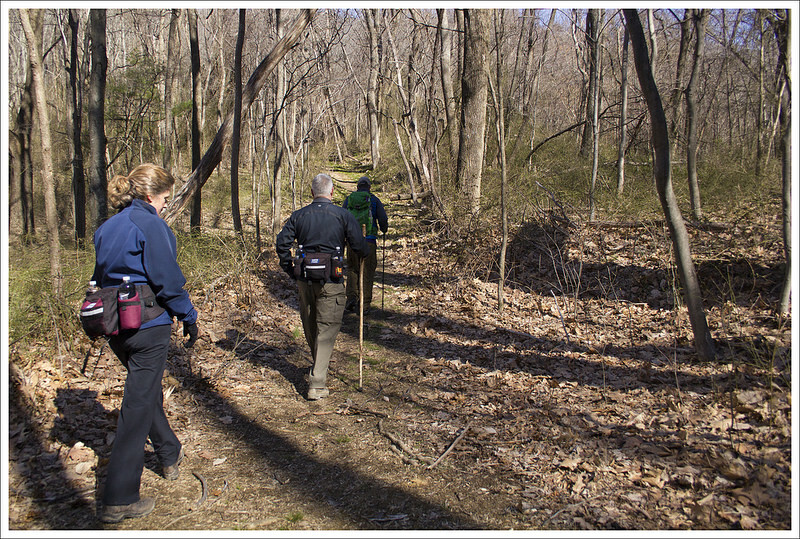 The trail was in fantastic shape – very well maintained and tended to by the PATC. Views – 3.5. There’s a beautiful, but not quite panoramic view on the northern flank of Pass Mountain. Streams/Waterfalls – 0. There isn’t any stream scenery, but there is a spring behind the Pass Mountain Hut. Wildlife – 4. We saw bears – a yearling cub and mama! Ease to Navigate – 4. The trail is well marked and easy to follow. Solitude – 4. We saw one couple at the hut, but no one else at all during the entirety of the 8+ mile hike. 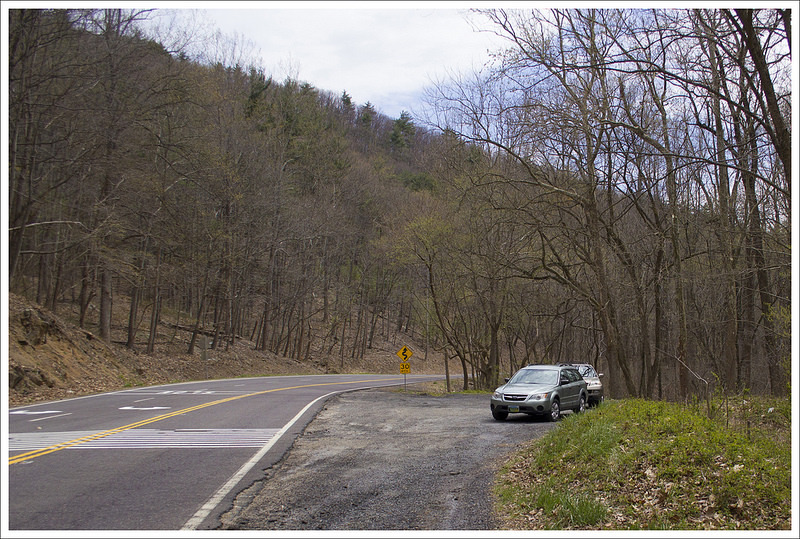 Directions to trailhead: The trail is located off of US-211 about 12 miles east of Luray, VA and 2.8 miles east of where US-211 crosses Skyline Drive. The gravel lot is located at 38.66855, -78.28999. Cross the road (be careful as this is a blind curve and cars may not see you easily) and at the bottom of the steep, sharp curve you will see the signpost for the Pass Mountain Trail. I just hiked the Pass Mtn Trail for the first time 4 days ago, so it is fresh in my mind – so much for getting work done today! Note that there is a trail from the parking area to just across U.S. 211 from the signpost on the south side of the road. Still not an easy road crossing, but I felt safer than walking along U.S. 211 with my dog. I want to go back to check out the old Butterwood Branch road sometime – that is one of the two fire roads that used to leave the trail at the site of the concrete post you mentioned. So many things to explore! Thanks for the visit! We could definitely tell there used to be a road there. I wonder if there’s anything worth seeing. Let me know if you explore!